Describe the basic processes, functions, and influences of weathering. Explain the main influences of weatherDetermine the main influences of mass wasting. Compare the difference between fast and slow subsidence. Determine ways mass wasting processes may be limited. Recently Utah has experienced a few deaths from either avalanches or rock falls. What is the responsibility of individuals versus government land use policies in regards to these hazards? Weathering is the process that changes solid rock into sediments. With weathering, rock is disintegrated into smaller pieces. Once these sediments are separated from the rocks, erosion is the process that moves the sediments away from it's original position. The four forces of erosion are water, wind, glaciers, and gravity. Water is responsible for most erosion. Water can move most sizes of sediments, depending on the strength of the force. Wind moves sand-sized and smaller pieces of rock through the air. Glaciers move all sizes of sediments, from extremely large boulders to the tiniest fragments. Gravity moves broken pieces of rock, large or small, downslope. These forces of erosion will be covered later. Once rock material has been broken down into smaller, unstable pieces by weathering, the material has the potential to move downslope called mass wasting (also called a landslide). Before looking into the various types of landslides, the factors that influence them must be examined. The steeper the slope, the stronger the friction or rock strength must be to resist downslope motion. The steepest angle a slope can be before the ground will slide is about 35 degrees, called the angle of repose. Many times we will cut through a slope to make room for a road or other forms of development. So to help prevent the slope from sliding along these cut areas, retaining walls must be build. More on this later. Another factor that determines mass wasting is the slope's materia. Mass wasting is more prone on slopes that contain clay and shale. Without going into great detail here, the shape and composition of individual clay particles can absorb water and prevent water from peculating through the ground. A layer of clay on a slope can prevent water from filtering through the slope. Instead, the water stays near the surface and saturates the ground. This can cause the surface layers to lose friction and slide. A region's climate can also determine the likelihood of a landslide. Climate is based on temperature and precipitation. Mass wasting is prone in the spring-time when snowmelt, water saturation, and runoff is greatest. Also the type of climate will help determine the type of mass wasting. Humid climates tend to have slides, where water-saturated slopes fail and fall. Drier climates tend to have rocks that fall; especially early spring. Canyons and places prone to wildfires tend to have debris flows. The amount of water in the soil is a major factor in the stability of a slope. When you build a sand castle, water is needed to build the walls and towers. That is because water has surface tension and is attracted to each other. This allows you to build towers greater than the angle of repose. So a little water can actually prevent slopes from sliding. But too much water lubricates the individual grains of sediment decreasing friction between each grain, so the possibility of mass wasting increases. The increase of water within the soils can come from over watering, pipe or swimming pool leaks, or prolonged stormy weather. In Utah and many mountainous regions, spring runoff of snow melt increases the water content within the soil. The following is a video from the USGS of the La Conchita, California landslide in 2005. Notice how well it flows down the mountainside. There are two reasons why this landslide occurred. First, this slide occurred on the same slope as a previous landslide in 1995. But the 2005 slide was also influenced by the fact that above is an orchard that was over-watering the vineyards and over-saturated the soil. A rock fall are the fastest of all landslide types and occurs when a rock falls through the air until it comes to rest on the ground - not too complicated. In Utah, they are common in the spring and fall because of what is called freeze-thaw weathering. In the daytime, temperatures in the spring and fall tend to be above freezing, which allows liquid water to enter cracks within rocks. Rather than rotating, a translational slide occurs when slope failure occurs parallel to the slope. Often times the slope failure occurs on soil composed of clay or shale, or along old fault lines, or previous slide areas. What makes translational slides dangerous is that they tend to flow faster and travel farther than rotational slides. The most expensive translational slide in U.S. history actually occurred in Thistle, Utah in 1983. The Utah Geologic Survey also provides a Google Earth file that looks at the Thistle landslide. Image source: This image is in the public domain because it contains materials that originally came from the United States Geological Survey, an agency of the United States Department of the Interior. 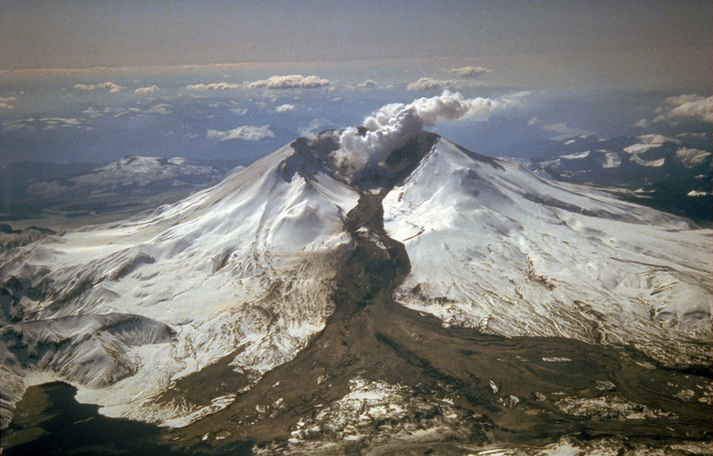 Lahars were mentioned in the module on volcanoes, but in essence they are volcanic landslides. Recall that volcanoes eject pyroclastic material ranging is size from ash to boulders. Now there tends to be two ways lahars occur. One is if a thunderstorm precipitates large amounts of moisture on the pyroclastic material and the pyroclastics flow downslope. The other option is if a volcano is snow-capped and the heat from the volcano causes some of the snow to melt and mix with the pyroclastic material. What makes lahars so dangerous is that they have the consistency of concrete and can travel hundreds of miles. If people dig into the base of a slope to create a road or a homesite, the slope may become unstable and move downhill. This is particularly dangerous when the underlying rock layers slope towards the area. Ultimately preventing landslides is impossible because gravity will always exist. But smarter development can help minimize the risk and hazards created by landslides. One component in landslide mitigation is basic drainage control of water. Recall that water can cause slopes to lose their friction as water lubricates individual grains of soil. And if you cut a slope and put a retaining wall for support, you may be preventing the water from filtering through. Thus you will often find drains at the base of retaining walls that allow underground water to within the slopes to drain out. Slow subsidence occurs when the water within the sediment is slowly squeezed out because of overlying weight. There are several examples of slow subsidence, but the best one is Venice, Italy. Venice was built at sea level on the now submerged delta of the Brenta River. The city is sinking because of the overlying weight of the city and pumping of ground water. The problem now is that sea levels are rising as glaciers melt and water expands due to global warming. An example of slow subsidence in the U.S. includes New Orleans, Louisiana. As we all know from Hurricane Katrina, the Mississippi River has a vast network of levees that prevent the massive river from flooding - most of the time. But by preventing the spring-time flooding, we are preventing the river from depositing sediment onto the land. Instead, the sediment is being transported to the Gulf of Mexico creating the massive Mississippi delta. Below is a Landsat satellite image from NASA of this delta. Fast subsidence occurs when naturally acidic water begins to dissolve limestone rock to forma a network of water-filled underground caverns. But if droughts or pumping of ground water reduces the water table below the level of the caves, they caverns collapse creating surface sinkholes. Ultimately preventing landslides is impossible because gravity will always exist. But smarter development can help minimize the risk and hazards created by landslides. One component in landslide mitigation is basic drainage control of water. Recall that water can cause slopes to lose their friction as water lubricates individual grains of soil. And if you cut a slope and put a retaining wall for support, you may be preventing the water from filtering through. Thus you will often find drains at the base of retaining walls that allow underground water to within the slopes to drain out. Slope support is one of most common types of mitigation for potential landslides. As mentioned above, a retaining wall can be built to support a steep slope. Next, the retaining wall must be anchored to the bedrock within the slope to hold the wall to the slope. Another type of slope support is simply planting vegetation. The roots of vegetation tend to grab and hold soil in place, so by planting various types of plants and trees can be a simple and cheap way to stabilize a slope. Be aware of your surroundings and notice changes in the natural world. Look for cracks or bulges in hillsides, tilting of decks or patios, or leaning poles or fences when rainfall is heavy. Sticking windows and doors can indicate ground movement as soil pushes slowly against a house and knocks windows and doors out of alignment. Look for landslide scars because landslides are most likely to happen where they have occurred before. Plant vegetation and trees on the hillside around your home to help hold soil in place. Help to keep a slope stable by building retaining walls. Installing good drainage in a hillside may keep the soil from getting saturated. For more on what homeowners can do to minimize your risk to landslides in Utah, click here.